The Right Revd Michael Comerford (1831-1895) was Coadjutor Bishop of Kildare and Leighlin at the end of the 19th century, and a prominent archaeologist and historian. He remains unchallenged as the historian of the Diocese of Kildare and Leighlin, but he was also a founding member of both the Ossory Archaeological Society and the Co Kildare Archaeological Society, and he was a prominent member of the Royal Society of Antiquaries of Ireland, founded originally as the Kilkenny Archaeological Society. A member of the Newtownbarry or Bunclody branch of the family in Co Wexford (see Comerford 8: Comerford of Bunclody and Dublin), Bishop Comerford helped to restore two of the monuments to his ancestors from the Ballybur branch of the family in Grange Churchyard, Co Kilkenny. Although he had been consecrated as coadjutor bishop, he never succeeded as Bishop of Kildare and Leighlin, yet he is remembered for his key role in building Carlow Cathedral, where he was buried before the high altar and where an ornate Flemish pulpit was dedicated to his memory. Michael Comerford was born in April 1831 in Tullow Street, Carlow, the youngest son of James Comerford (ca 1788-1859) of Clohamon and Newtownbarry (Bunclody), Co Wexford, and Brown Street, Carlow, and his wife Catherine Rooney (see Comerford 8: Comerford of Bunclody and Dublin). James Comerford, who had moved from Newtownbarry to Carlow, was a pawnbroker at 11 Brown Street, and he also owned property close to the Methodist Church in Charlotte Street, Carlow. 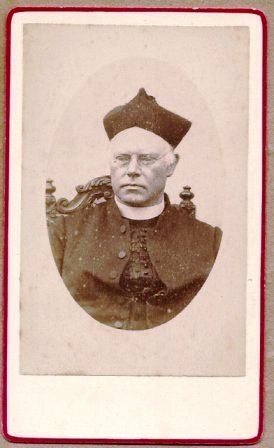 He finished his studies in 1855, but his ordination was delayed, owing to the death of the Bishop of Kildare and Leighlin, Francis Healy. Eventually, Comerford was ordained on 13 May 1856 in Carlow Cathedral by the newly consecrated Bishop of Kildare and Leighlin, Dr James Walshe. Comerford began his ministry as a curate at Kill (1856-1857), and then moved to Maryborough (Portlaoise), Queen’s County or Co Laois (1857-1861), Arles (1861-1862), Naas, Co Kildare (1862-1863), and Monasterevin, Co Kildare (1863-1878), before being appointed Parish Priest of Monasterevin in 1878. When the future bishop’s father, James Comerford, died in Carlow Town on 2 November 1859, he was buried in Saint Aidan’s Cathedral, Enniscorthy, and his son, the Revd Michael Comerford, then a curate in Maryborough (Portlaoise), Co Laois, was named as his sole executor. Dr Comerford was a vice-president and one of the founders of the Co Kildare Archaeological Society, and he contributed several valuable papers to the society’s journal. In addition, he was a founder member with John Hogan of Ormond House, Kilkenny, of the Ossory Archaeological Society. In 1869, while he was curate of Monasterevan, Comerford, Hogan and another Kilkenny historian, William Healy, were involved in re-erecting two Comerford family monuments in Grange Churchyard, near Ballybur, Co Kilkenny. The graveyard surrounding the church looks out across Ballybur Castle and the surrounding lands to the east. 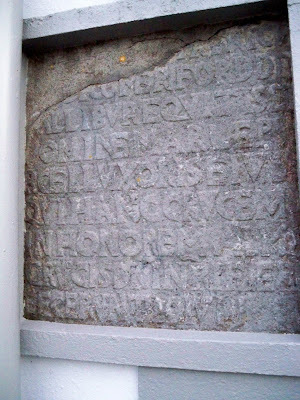 The first monument was an altar-tomb with an ornamental reredos and Latin inscription commemorating Comerford’s ancestor, Richard Comerford of Ballybur, who died in 1637, and his wife Mary Purcell [See 4: Comerford of Ballybur Castle and Kilkenny City]. However, I was unable to identify this monument when I last visited Grange Churchyard. The second monument, inserted into the corner wall of Grange Church, also commemorates Richard and Mary Comerford. Michael Comerford was parish priest of Monasterevin from 1878 until his death in 1895. As Parish Priest , he built a new parish church, the Church of Saint Peter and Saint Paul, in Drogheda Street, which was designed by William Hague (1836-1899). The church was dedicated on 19 October 1879. The sermon at the dedication was preached by his fellow historian, Bishop Patrick Moran of Ossory, later Cardinal Archbishop of Sydney. [McEvoy (2000), p. 104.] The church was completed in 1880. The altar rails in the church were originally made for the Church of Saint Stefano, Venice, but were bought by Stephen Ram of Ramsfort, Gorey, Co Wexford, who brought them to Ireland and placed them on his terrace. 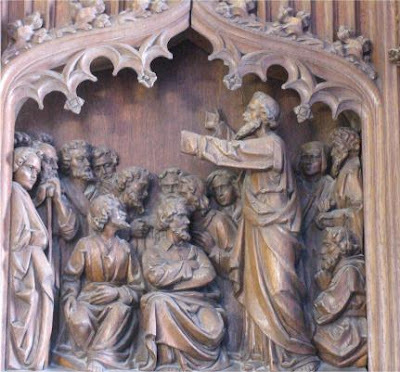 One-by-one, the members of the Ram family slowly joined the Roman Catholic Church, and the altar rails were presented to Michael Comerford for his new parish church. As parish priest of Monasterevin, Co Kildare, Comerford also had a monument placed over the grave of Father Prendergast who had been court-martialled and hanged there in 1798. As parish priest of Monasterevin, Michael Comerford also befriended the English Jesuit poet Gerard Manley Hopkins (1844-1889), who was a Professor at Newman’s Catholic University in Dublin. Hopkins was a regular visitor to Monasterevin, Co Kildare, between 1886 and 1889, and the town became one of his few sanctuaries in Ireland. He stayed at Monasterevin House on at least seven occasions as the guest of the Cassidy sisters and, although he was free of any pastoral duties, he said Mass in their private oratory and assisted Michael Comerford (1830-1895) at the Holy Communion in the newly-built parish church. Norman White of University College Dublin has recalled many conversations on politics and history between Comerford and Hopkins. Hopkins first visited Monasterevin at Christmas 1886, when the Cassidy family sought a priest to say Mass for them in their private oratory in Monasterevin House. At the time, there were two dominant interests in Monasterevin – Moore Abbey, seat of the Earls of Drogheda, and Cassidy's Distillery, founded in the 1780s by John Cassidy. Monasterevin House was the home of Miss Mary Cassidy, and her sister Eleanor, widow of Daniel O’Connell Wheble, who had been manager of the brewery section of the Cassidy business. Both women were in their late 50s or early 60s when Hopkins first went to stay in Monasterevin, and in the 1880s the Cassidy family dominated the social and economic life of Monasterevin and the surrounding countryside. At Monasterevin House, Hopkins was free of politics and was comfortable among Roman Catholics who were unquestioningly loyal. There he learned of the town’s recent history from the parish priest, Father Michael Comerford, who had recently published his three-volume history of the diocese, and with whose political responses Hopkins was sympathetic. In 1798, the Catholic curate of the parish, Father Edward Prendergast, had been tried by court-martial in Monasterevin House, two weeks after the Battle of Monasterevin, and was hanged from a tree in what became the Cassidy’s garden, on the other side of the Main Street, on the banks of the Barrow – a garden where Hopkins did some quick sketches. The Cassidys had not owned the house at that time, but were loyal supporters of the government when Hopkins visited almost a century later. There are signs in his history that Michael Comerford tried to smooth over and lessen political tensions in the town, but Hopkins mentions that his curates were, contrary to his example, leaders of the Land League agitation in the district. Comerford’s three-volume Collections relating to the Dioceses of Kildare and Leighlin is a marvellous source of material on the records and traditions of the dioceses. At the age of 57, Michael Comerford was appointed titular Bishop of Corycus in Cilicia Prima (modern-day Çukurova in the province of Mersin in southern Turkey) and Coadjutor Bishop of Kildare and Leighlin by Pope Leo XIII on 2 November 1888, with the right of succession as Bishop of Kildare and Leighlin. He was episcopally consecrated in Carlow Cathedral on 1 January 1889 by Archbishop William Walsh of Dublin, assisted by Bishop James Browne of Ferns and the Bishop Piers Power of Waterford. Five months later, his friend the poet Gerard Manley Hopkins died in Newman House, Dublin, on 8 June 1889. As coadjutor bishop of the diocese, Michael Comerford lived at Braganza in Carlow. But until his death he continued to hold the nominal position of Parish Priest of Monasterevin, where Father James Hughes did the effective work of parish priest with the title of Administrator. 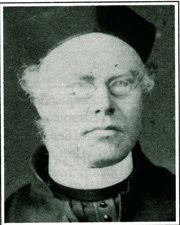 One of his curates in Monasterevin was the Revd Joseph Farrell, the author of The Lectures of a Certain Professor. On the following day, after saying mass, the bishop visited Monasterevin, and on Ascension Day, Father Murphy accompanied the bishop to Suncroft where confirmations were held. On the following day, the bishop returned home by train. Michael Comerford died suddenly on 19 August 1895 without living to succeed as Bishop of Kildare and Leighlin. He was outlived by the aged Bishop James Lynch, whom he had been appointed to succeed. He was buried in front of the High Altar in Carlow Cathedral, where the Flemish pulpit was erected in his memory. Father Michael Murphy of Kildare, who attended the bishop’s funeral, later wrote that Comerford “was taken away practically in the prime of life, after a few short years in the episcopate and when he had just succeeded in winning universal esteem. There were vespers in Braganza, the bishop’s residence in Carlow, and a magnificent demonstration of respect and of sympathy in the procession of religious confraternities through the town where all of the shops were closed and crape universally worn.” The funeral rites concluded with Matins and Lauds in the cathedral. Journal Co Kildare Archaeological Society, 3 (1896-1899), pp 1-2; (Revd) B. Canning, Bishops of Ireland 1870-1987, Ballyshannon, n.d. (ca 1988), p. 213. © Patrick Comerford 2009, 2010, 2011, 2012, 2013, 2016. Last updated 22 October 2009; 1 and 10 October 2010, 9 November 2010; 23 February 2011, 4 July 2011; 14 April 2012; 15 April 2013; 26 April 2016. As a student of English Literature in my final year of study at The University of Roehampton in London, I have chosen to write my dissertation on Gerard Manley Hopkins. So I am particularly pleased to read your notes on Hopkins's time spent at Monasterevin House. I hope to visit there one day because I am interested to know if Mrs Cassidy's house still exists as the home which Hopkins would have visited?